Freshwater fishing&apos;s "Holy Grail" now has dual holders as the 22-pound, 4-ounce bass caught by Japan&apos;s Manabu Kurita matches the International Game Fish Association&apos;s record held for 77 years by Georgia&apos;s George Perry. Japan&apos;s Manabu Kurita, 32, caught the fish July 2 on Japan&apos;s largest lake. The 70-year old non-profit fisheries conservation, education and record-keeping body, received Kurita&apos;s application and documentation on Sept. 19. The largemouth bass (Micropterus salmoides), was caught from Lake Biwa, which is an ancient reservoir northeast of Kyoto. Kurita was fishing Biwa that July day using a Deps Sidewinder rod and a Shimano Antares DC7LV reel loaded with 25-pound Toray line when he pitched his bait, a live bluegill, next to a bridge piling. 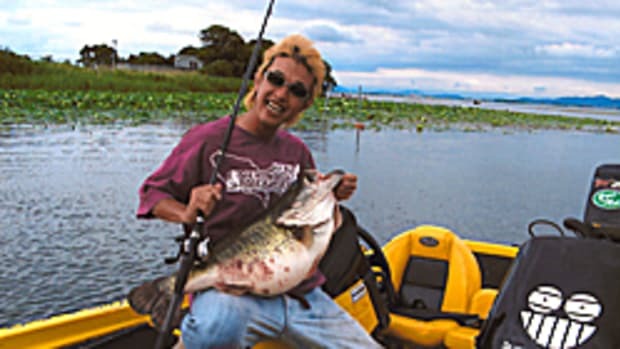 It was Kurita&apos;s first cast to the piling where he had seen a big bass swimming. He only twitched the bait a couple of times before he got bit. After a short three-minute fight he had the fish in the boat. "I knew it was big, but I didn&apos;t know it was that big," Kurita said. Kurita&apos;s fish ties the current record held for more than 77 years by Perry, who caught his bass June 2, 1932 on Georgia&apos;s Montgomery Lake, near Jacksonville, Ga. That 22-pound, 4-ounce behemoth won Field and Stream magazine&apos;s big fish contest and 46 years later, when the IGFA took over freshwater records from Field and Stream, it became the All-Tackle record, now one of more than 1,100 fresh- and saltwater species the IGFA monitors. IGFA All-Tackle records are now free for viewing by the public at igfa.org.